1) Your Drug May be Your Problem (How and Why to Stop Taking Psychiatric Medications) by Dr. Peter Breggin and David Cohen Ph. D PDF here. Anatomy of an Epidemic challenges readers to think through that question themselves. First, Whitaker investigates what is known today about the biological causes of mental disorders. Do psychiatric medications fix “chemical imbalances” in the brain, or do they, in fact, create them? Researchers spent decades studying that question, and by the late 1980s, they had their answer. Readers will be startled—and dismayed—to discover what was reported in the scientific journals...."
Michael F. Shaughnessy - The chances are 90% or more of someone being misdiagnosed―not just in psychiatry but in most of medicine, and perhaps a lower percentage among many who consult psychologists, social workers or counselors. 1) Dr. Whitfield, your book discusses those individuals who may be misdiagnosed. In the field of psychiatry, what are the chances of someone being misdiagnosed? The chances are 90% or more of someone being misdiagnosed―not just in psychiatry but in most of medicine, and perhaps a lower percentage among many who consult psychologists, social workers or counselors. The problem is two-fold: for nearly all patients who present to clinicians with psychiatric or psychological symptoms (emotional, behavioral or relationship pain or problems) the helping professionals’ 1) using the unscientific psychiatry diagnostic “bible” called the DSM (which most of the latter group still uses), and 2) then after misdiagnosing them, giving drugs or referring them for drugs as an answer. Most of we prescription writers were taught how to write them but not so much how to discern which drugs worked well and which ones were more toxic than helpful. Many who come for help with these complaints actually have PTSD or other effects of trauma which can mimic the symptoms of “mental illness.” Most physicians and many non-MD clinicians don't know or don't have skills in recognizing the effects of repeated childhood and later trauma on peoples' mental and physical health. Those hurtful effects are significant and large. The scientific evidence is also significant to overwhelming for repeated trauma as a causal factor in disrupting the victim's mental and physical health. For example, in my two prior books The Truth about Depression and The Truth about Mental Illness I document well over 300 peer reviewed and data based studies that were published worldwide that show how repeated trauma causes all kinds of psychological, emotional and physical pain that can be and is regularly misdiagnosed as being one kind or another of "mental Illness" and then mistreated with toxic and mostly ineffective psychiatric drugs. I summarize and discuss these study results in table E-1 from The Truth about Mental Illness and Not Crazy below. 2) Now, often there are side effects to medications, and then additional pills are given to counteract the side effects. What is going on here? Especially for psychiatric drugs the term "side effects" is a cover-up for what the correct term should be―which is toxic effects. As others such as psychiatrists Peter Breggin, Grace Jackson, Joanna Moncrieff and I describe, nearly all psychiatric drugs today are neither satisfactorily effective, specific for any so called "mental illness," nor safe. They don't work well and are commonly detrimental to our well being if we take them long term. Their effects do not hit the target of the presenting complaints well. Rather, their effects are like a shot gun blast, as illustrated from a figure in Chapter 14 in my new book called Not Crazy: You May Not be Mentally Il (see figure). As I write on page 181 in this new book: “A major reason why most commonly prescribed psychiatric drugs are non-specific in their actions and don't work well is because they do not hit the target at which they are aimed, i.e., at one or more presumed mental illness(es). Instead, nearly all of these drugs tend to detrimentally affect many if not most of our organs, functions, and useful human faculties outside of or in addition to the target symptom or symptoms. In that sense they have been called "shotgun" drugs. It is as though a marksman is shooting at a target to hit the bulls eye (the symptom or “mental illness” alone) with a single bullet, but instead hits most everything outside the target (i.e., the drug's toxic effects, which BigPharma and the other Bigs disguise by calling them "side effects"). In this sense a psych drug’s shotgun blast at times may hit parts of the target, but it also hits almost everything else in the area―in and around the area in which the target sits, including the trees, the ground and any animals or humans who may be in the background (Figure 14.1). 3) Dr. Whitfield, we all have problems and have to deal with death, loss, problems and despair. Should all individuals who have suffered a loss or death be diagnosed and given anti-depressants? This is a nearly universal experience that people have who come to clinicians who then misdiagnose their sadness, low energy, anxiety (the common code word for fear), and so forth as "depression" or some other "mental illness" and who are then mistreated with antidepressants and/or other psychiatric drugs. If their symptoms persist, they are commonly further mistreated with "mood stabilizers" (which are actually toxic and expensive anticonvulsive drugs that sedate, promote weight gain and other problems―see figure above) and/or with the even more toxic and addicting antipychotics. Grieving is a natural part of our human experience. Life gives us hurts, losses and traumas for which we normally feel sad and grieve. In psychotherapy we see sadness and grieving as an opportunity to learn to listen to our inner life. What we have lost can often give us gifts if we open to that possibility. 4) There is this big debate about attention deficit disorder and these kids being given Ritalin, Adderol, Cylert, Concerta, Strattera etc etc (It’s amazing that I have these drugs memorized-what does this say about the field?) Is there any virus, bacteria, or fungus or anything that can definitively diagnose ADD or ADHD? ADD is a condition generally made-up by Big Pharma and supported by the other Bigs (Big Government, Big Insurance, Big Academia and Big professional groups) to sell drugs, control people, and maintain their own jobs. Here, those most affected are especially children and increasingly adults who were drugged as kids (and now are commonly still addicted to stimulants and other psychiatric drugs) and/or who want just to use speed legally as a drug. As is true for all common "mental illness," there is no laboratory or other definitive medical diagnostic test to prove that ADD (or ADHD) is a real illness, such as is readily available for diabetes or cirrhosis of the liver. It remains as another bogus marketing device to sell Big Pharma’s drugs, control people and maintain those people’s jobs who promote these stimulants. 5) A lot of times, children misbehave badly, adolescents behave badly and let’s face it, even some adults commit crimes. Should they all be medicated? Or should they be put in jail? or a padded cell or straight jacket? Of course, usually not for the children and adolescents. I admire and recommend the work of James Lehman who pioneered the Empowering Parents program, which shows too-often-enabling parents how to set healthy boundaries and limits with their misbehaving children (see http://www.empoweringparents.com/#). Unfortunately, for criminals the criminal justice system frequently forces many of those convicted to take these toxic psychiatric drugs against their will and usually to their detriment―and which commonly does nothing to prevent further crimes, as I address in Not Crazy. The reader may consider looking at your informative archives that you published on 11/25/2007 for your clear and excellent interview with investigative mental health journalist Robert Whitaker about the drugging of children in America. There he describes how stimulants such as Ritalin and antidepressants too often disrupt a child's mental and emotional equilibrium to such an extent that they get worse and are then misdiagnosed as "bipolar," when in fact this result is actually one of the many toxic effects of these drugs. Then unfortunately, after being misdiagnosed as bipolar the child commonly is given an even more toxic antipsychotic drug and/or a "mood stabilizer," which then usually make them worse instead of better. I describe this worsening process in a recent article entitled "Psychiatric Drugs as Agents of Trauma" in the December 2010 issue of the International Journal of Risk and Safety in Medicine. I call this worsened condition the Drug Stress Trauma Syndrome, which I also describe in detail in Chapter 7 of Not Crazy. 6) Alcoholism, Addictions and mental illness- where does one draw the line? 7) In the minds of some people “relief is just a swallow away”. They think that some pill will banish their fears, worries, anxieties and difficulties. How do we convince these people that counseling may be a better approach? This is what I have addressed in my latest twin pair of books: The Truth about Depression and The Truth about Mental Illness. I now expand that information in Not Crazy. I describe how nearly all psychiatric drugs do not work well and how most don't actually help people in this kind of pain at all. They are toxic and addicting. Look again at Figure 14.1 above. 8) What are your concerns about “forced drugging” especially among the elderly? I address forced drugging throughout Not Crazy and especially in its Chapter 10 titled “Forced Drugging.” It is a form of legalized and slow poisoning as Grace Jackson eloquently describes in her recent book Drug-Induced Dementia: A Perfect crime and Peter Breggin also does in most of his books and articles. 9) I gotta say - I see these commercials on TV and they are advertising drugs for dry eyes, and for erectile dysfunction and for all sorts of problems breathing- and these commercials are very well done and one may think that magically, all these problems are going to vanish. However, even as an EMT, I know that people have seizures, asthma attacks, and simple stomach aches- your thoughts? Some chemicals or botanicals used as medicines are helpful and can be life saving at times. But as my colleague J. Douglas Bremner has written in his excellent book Before You Take that Pill, many are also dangerous, and just as psychiatric drugs, they don't work well either. 10) This question may be irrelevant, but it does seem that name brand drugs work often much better than these generics. I have seen this in some populations I used to work with. What is going on here? Most generics work well when compared with brand names. Some don't. It is usually a matter of trial and error to determine what works best for each patient. Brand names are expensive. In the early 1990s the anti anxiety (code word for anti fear) drug Buspirone/BuSpar was around $200 for a month’s supply. Today it is from $4 to $10 at pharmacies that have such generic plans. Buspirone is among the safest and least toxic psychiatric drugs, and it works better than most others. Because it is so important, I address the importance of good sleep in Chapter 15 of Not Crazy in some detail. Chronic sleep loss can make us feel and sometimes act crazy. Of course nutrition and regular exercise are nearly as important, and doing all three well can make us feel and live better and longer. 12) Now, lastly tell us about your book and where it is available and why you wrote it. I wrote this new book over the past three years. It is a summary of what I have learned early during my career as a general physician for the first 15 years and then over the past 30 years as a holistic psychiatrist and addiction medicine specialist. It is available on Amazon.com and on our websites cbwhit.com and barbarawhitfield.com; click the PayPal button to order it. It is also distributed to bookstores by Ingram, the world’s biggest book distributor. Countless people across the USA and world are being misdiagnosed and mistreated for “mental illness” that they do not have. The problem is that only a few helping professionals are pointing this out. There are too few whistle blowers. After seeing many of my patients for years that have been mislabeled and mistreated, I have now written this book to tell you what I have observed and what the truth may be for them―and possibly for you or someone who you may know. I have written it to summarize how you and they can finally begin to heal and recover without psychiatric drugs. This summary includes finding and naming the original traumas we experienced and those traumas we are experiencing now from toxic drugs and clinicians who don’t listen to us and don’t guide us in the right direction to heal. I describe how to accomplish these do-able tasks in this book. Some readers will be skeptical about what I say. They may believe that they have a reasonable explanation for their problems and pain. They are convinced that they “mentally ill.” For some their symptoms may have been helped for a time by their taking a psychiatric drug, such as an antidepressant, an antipsychotic, a “mood stabilizer” or some other drug. Others may have believed that they might have a mental illness because they have been told by someone else – a clinician, family member or friend or by reading a book or article. But do they or you have to believe that? Whatever your situation, persuasion or preference, you may consider reading what I have observed and learned about mental illness, healing and recovery from countless of my patients and the scientific literature over the past 3-plus decades. This book is a remarkable and cutting edge summary of facts, psychological skills and wisdom that combines the best healing principles of trauma psychology with holistic psychiatry. Dr.Whitfield explains in some detail how the reader can use practical and proven non-drug techniques and recovery aids to handle their psychological, emotional and behavioral symptoms. Caution: This book contains an indictment of the psychiatric drug industry and an enlightening exposure of their dogma for the people who are taking these brain disabling drugs and those who care for them. I have known Charles Whitfield for 20 years and believe that this is the most telling and powerful of his several books on mental health and recovery. As a longtime psychology professor and clinician I am impressed with how clearly and concisely he describes what causes the emotional, behavioral and relationship pain for those labeled as “mentally ill” and then what works best to heal their problems. He also tells the truth about how and why psychiatric drugs don’t work well and too often make people worse. Highly recommended. Unhinged: The Trouble with Psychiatry - A Doctor's Revelations about a Profession in Crisis by Daniel Carlat. -This is a worthy book because it's written by a psychiatrist in the trenches who's had a "moment of clarity" about his field and tells us, from a psychiatrist's point of view, how the sausage is made. His honesty is so bold and courageous it's almost shocking. In fact, I'm surprised he didn't lose his job over how honest he is about his (and the profession's) massive shortcomings and pseudoscience. Very easy to read, as well. Although this is a more all-inclusive look at the corruption of US health care in general, it does mention antidepressants. This really is the bible of investigative journalism of the US healthcare system in my opinion. The author -- himself a lapsed primary care physician -- does a tremendous job of bringing the reader to speed on how multi-layered and rotted to the core so much of the health care is in this country. He covers everything from the rise of HMOs to how doctors are trained to the reason for the dangerous lack of primary care doctors to (of course) the dizzying lengths Big Pharma goes to sabotage medicine in the name of the almighty dollar. 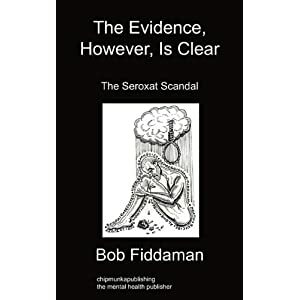 Bob Fiddaman was prescribed Seroxat due to depression that was, in essence, due to work related problems. What followed was a journey that took him through a tapering process of, what he believes to be, a highly addictive antidepressant. Following almost two years of withdrawal, Fiddaman's new battle with the manufacturer of the drug, GlaxoSmithKline and the UK's medicine regulator, the MHRA, took him on a more frustrating journey than he ever could have imagined. The name Bob Fiddaman has become synonymous throughout cyberspace. Google his name and you will find articles he has written, many of which have been republished by a vast army of fellow patient advocates. In his debut book, Fiddaman takes the bull by the horns and pulls no punches. Doctor's and patients alike will find Fiddaman's journey both tragic and informative, in particular the current stance of the UK regulator with regard to pregnancy and antidepressants. It may also make you stop and seriously reconsider the safety and efficacy of the medications you take. By Alison Bass. 260 pp. Chapel Hill, NC, Algonquin Books of Chapel Hill, 2008. $24.95. ISBN 978-1-56512-553-7. In July 2003, Rose Firestein, a tenacious lawyer working with the New York State attorney general's office on a consumer fraud lawsuit against GlaxoSmithKline, noticed something curious on the Web site of the Food and Drug Administration (FDA) — a press release stating that three clinical trials of the company's antidepressant Paxil (paroxetine) in children with depression showed that the drug was no more effective than a placebo. Firestein was shocked, given that Paxil was the second most widely prescribed antidepressant for children. Firestein kept digging and quickly discovered that GlaxoSmithKline had actually conducted nine clinical trials with Paxil but had published just one of them. What the drug maker was hiding from the public was the bad news about Paxil: it did no better than a placebo in at least two of the unpublished studies, and there was disturbing evidence that patients who took Paxil were nearly three times as likely to experience suicidal feelings, thoughts, and behavior as those who took a placebo. Alison Bass, a former medicine, science, and technology reporter at the Boston Globe, has put on trial in her book far more than just a bestselling antidepressant — she has used the case of Paxil to expose the unsavory and self-serving relationships among members of the pharmaceutical industry, psychiatrists, and members of the FDA. And she does it in a book that has the brio of a crime thriller. begins in 1990, when Harvard University psychiatrist Martin Teicher published a report of six depressed patients in whom intense suicidal thoughts developed during treatment with the new antidepressant Prozac (fluoxetine). ....Teicher's suspicions were later confirmed by the British psychiatrist David Healy, who, as an expert witness in several lawsuits, had access to confidential internal drug company documents about clinical trials of various selective serotonin-reuptake inhibitors (SSRIs) used as antidepressants. These documents showed that there were higher rates of suicidal symptoms in patients who were taking the SSRIs than in those taking a placebo. When the FDA finally did a meta-analysis of pediatric depression trials in 2004, it also confirmed Teicher's early concerns: subjects taking antidepressants had nearly double the rate of suicidal thoughts, suicidal feelings, and nonlethal suicide attempts of those taking a placebo. Beginning in October 2004, the FDA required that all antidepressants carry a black-box warning for pediatric patients; the warning was expanded to include all patients in May 2007. What took so long? In Bass's view, the FDA knew of the risks all along but procrastinated. Perhaps, but one could just as well see the delay as the result of an underfunded FDA that was reluctant to issue premature warnings for fear of discouraging the use of antidepressants. Considering that the risk of actual suicide in untreated depression ranges from 2% to 12% — a risk that is far greater than the 4% risk of increased suicidal thoughts and nonlethal suicide attempts with antidepressant treatment — the worry seems reasonable. Still, the drug makers, through the Prescription Drug User Fee Act, essentially pay the FDA to review their products, and they pay handsomely — in speaker and consultant fees — the physician researchers who test their drugs. These financial ties, which Bass explores in great detail, can compromise scientific objectivity or, at the very least, can create the appearance of a conflict of interest that erodes public trust in research that is funded by drug companies. "Anatomy..." is a very valuable book, even without much devotion to w/d. I think it's the title most likely to stand out when we look back at this period in a generation. The shame of it, for me anyway, is that its best good comes when its read in a discovery process before starting the meds in place one. In this way I feel like an HIV+ person. Seems most of the energy is going to be expended on finding a vaccine to save the next generation. Those of us who are already infected, are more on our own. Got that, I know there are many good books out there from guys like Whitaker, Breggin, Healy etc., but I avoid reading them because is only reminds me of what we did not know and threw us in the darkness... thanks to SA and the other sites we know already what we must know, although it is a bit late for us. But I deeply respect those people for educating people and fight against the corrupt system. Sigh, I agree, Claudius, we know only too well of the dangers of these drugs. "Anatomy of an Epidemic" has been called the "Silent Spring" of psychiatry. "Silent Spring" stimulated popular interest in the environmental movement. Whitaker's book is one of the sources cited in the open letter to DSM-5 task force and American Psychiatric Association composed by members of the American Psychological Association, and clearly influenced some of what they said in the letter. So it's influenced some psychologists, at least! Thank you, drb. What do you think of Pharmageddon? the book is extremely read-worthy - do read it! I saw Dr. Healy speak about his book in my city. He said "pharmacosis," iatrogenic conditions brought on by too much medication, is epidemic -- with which I agree. There was a link on here somewhere about the invention (for lack of a better word) of the original AD's the tricyclics, and as the story goes...the Swiss Physician who development it, gave them to his patients in a psych unit. Many of them snapped out of their depression and improved. I never knew about that story. What does Dr. Healy and the others think about the tricyclics? Does anyone know. They certainly seemed to be safer than what's out there now and what we are trying to get off of. I do think modern medicine is largely lost and that the problems are insurmountable, at least as long as people keep supporting Big Pharma by working there and/or buying their stock, and as long as we here in the states are stuck with fifteen minute medical appointments during which no doctor can do much more than diagnose superficially and write a prescription. The public also has to change its attitudes regarding being "fixed" and pain-free immediately, and evading death for as long as possible, preferably forever. My viewpoint is that contemporary culture is itself insane, largely driven by greed, self-absorption, and lack of faith in God. Along with Big Phama, the media and the advertising industry have made significant contributions to a selfishness and materialism that's gone quite berserk. i may have missed one or two. (e.g., mood disorder, anxiety disorder, dissociative disorder, or a personality disorder)." most of them could be subsumed under the term "trauma"
Excellent suggestions. I merged the topic with our highlighted book recommendation topic. I agree, psychiatric practice seems very weak in differential diagnosis, and the primary care practitioners aren't doing it any better. I have read most of these book and Breggin's "Toxic Drugs" helped me withdraw from all my psych meds years ago. The book validated what I had gone through with poly drugging and it was unbelievable to read it. Thank you for the list of books and content descriptions. Can someone recommend some sound books that offer advice or information about antidepressant withdrawal ?? Please comment if you have read any of these books or have other recommendations. I have the Breggin book. I like it pretty well, except that he recommends a faster taper than I would do. Haven't read the others, although I've heard of Glenmullen. I personally am not aware of any books that I would recommend as a source of advice on how to taper ADs or how to deal with withdrawal. The best, most exhaustive and most accurate source of that information that I know of is this forum. Will Hall's Harm Reduction Guide is downloadable as a PDF and has some good stuff in it too. I agree with Rhi, I've searched for information and found this site to be the best source there is. read about the epidemic of 'mental' illness caused by the very drugs that are supposed to treat it! I did read Dr. Glenmullin's book and it was excellent. There is a link on this site for a check list by Dr. Glenmullin while tapering. I am sorry I don't remember what forum it was in. When you look over it you will feel validated. Regarding antidepressant withdrawal, I like the Glenmullen book. Your essential guide to overcoming dependence and withdrawal from sleeping spills benzo tranquillisers and anti depressants. Do any of these books talk about Neuro-emotion and other emotional manifestations that people talk about on this site, as well as what James Heaney talks about on his blog? Things like severe crying spells, preoccupation with the past, exaggerated negative reactions to ordinary life, temper tantrums and emotional meltdowns? I've read Breggin's new book Psychiatric Drug Withdrawal. It is not a comprehensive discussion of withdrawal. Rather, it's a compendium of all the reasons Dr. Breggin thinks people shouldn't be on the drugs in the first place. He does not address issues arising from cold turkey (which is alluded to only in a footnote), the sections on tapering are cursory and contain factual errors. He does not mention prolonged post-discontinuation syndrome at all, or the process of recovery from withdrawal symptoms. Unfortunately, he badly blew the opportunity to write the comprehensive book on psychiatric drug withdrawal. It has yet to be written. In my opinion, he has decided not to deal in depth with withdrawal at all. Instead, he uses scare tactics to discourage people from taking the drugs. On one hand, I believe his intentions are good: To protect patients. On the other hand, I think the information he disseminates is somewhat skewed towards fear-provoking rhetoric. He also has a very difficult overbearing self-aggrandizing personality. He's alienated a lot of people, including many of his allies. Psychiatrists simply ignore his overblown rhetoric. For books about tapering off psychiatric drugs, my preference is Joseph Glenmullen's The Antidepressant Solution. Of Peter Breggin's works, Your Drug May be Your Problem. Did you end up getting a response to a book suggestion specific to this? I have just read this book - or most of it - had to omit the parts about children on the drugs. God - it is happening here, too. I know, locally, of a 13-year old and her single mother who were put on ADs a few months ago. One of the most interesting bits of information, that may give hope to some of us, is that depression may be a self-limiting illness. Old records, particularly, seem to show that. Just wish I had known that in, say, 2001, the year I retired. Maybe I could have held out without them. The author is a danish physician, medical researcher, and leader of the Nordic Cochrane Center at Rigshospitalet in Copenhagen, Denmark. If you liked the book anatomy of an epidemic by Robert Whitaker, this is a nice follow up. The author documents how psychiatric drugs make more harm than good and uses research to build his hypothesis.